At Atlas Ceramics we stock a huge selection of mosaic wall tiles and mosaic floor tiles that boast a variety of styles and colours to suit your own personal tastes and to suit your tiling budget. Mosaic tiles are available in various materials the most common being ceramic and porcelain mosaic tiles, and natural stone mosaic tiles. Other types of mosaic tiles are also available and in general mosaic tiles often require specific adhesives and preparation due to the nature of the back of the tiles. These specialist tiles offer stunning decorative qualities but the tile backs can be quite smooth or dense which means the use of higher grade adhesives will be required in order to sufficiently bond the tile. Extra care must be taken when applying them to an area in order to ensure that they are perfectly secure. Glass mosaic tiles and metal or metallic mosaic tiles are becoming increasing popular creating amazing effects with any wall tiles or providing a dazzling feature wall in your kitchen or bathroom. Mosaic tiles are supplied on sheets for ease of application. You can usually find these sheets in 2 forms, either on a synthetic mesh or face down on paper. Each form requires its own application technique in order to achieve good final adhesion. 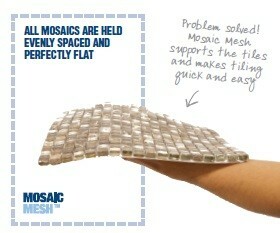 To fix your mosaic tiles efficiently the use of mosaic fixing mesh is a great way to ensure that all tiles are held both consistently spaced and seamlessly flat. The fixing mesh is applied to the underside of the mosaic sheeting in order to provide complete support when tiling, leaving you with a great finish. Some mosaic tiles are supplied face down on paper. These types should be pre grouted from the back before fixing to the wall. This helps to achieve a flat, smooth grout joint. We offer a wide range of Weber grouts, available in a variety of colours to contrast or match any tile. Using a tiling trowel, apply adhesive such as weber.fix WR plus to the mosaic sheet for fixing. 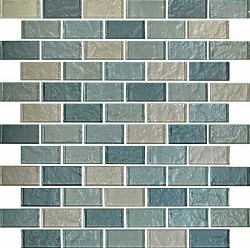 Gently tapping or pushing the mosaic tiles will help to achieve the desired contact. For floor tiles you can use weber.set. rapid SPF adhesive. Tiles which have mosaic fixing mesh should be applied in a similar way although they should not be grouted until the mosaics are in place and the adhesive itself has set. Pre-grouted tiles that feature a paper sheet should be moistened once in place with a wet sponge, allowing you to peel off the paper front. Mosaic tiles are available in a range of designs, with stylish contemporary designs offering an alluring effect within any space. We also stock beautiful classic designs, for those who love to add a more traditional, rustic look to their home décor. Glass mosaic tiles are great for creating fantastic feature walls and you highlight any space with our gorgeous ranges of metal or metallic mosaic tiles, boasting glittery effects and unusual designs. 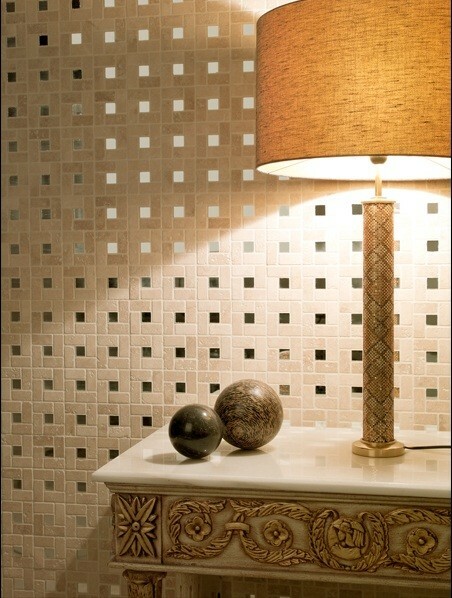 Mosaic tiles add an element of luxury to your home, creating a clean, lavish finish that will certainly impress. With multi textured finished and a variety of materials and colours, mosaic tiles certainly have a lot to offer, adding an outstanding finishing touch to any kitchen, bathroom or wet room. For help with fitting browse our range of tiling tools and accessories and don’t forget the all-important tile fixing products, such as weber grout and adhesive.